Wagner pulls away from the pack. Chisholm brothers once again on top! Wagner pulls away from the pack. Chisholm brothers once again on top. Cloudy skies and rain the night before made for a heavy track for the KC Lawn Care Slingshot races on Saturday May 30 at Deer Creek Speedway in Spring Valley, MN. 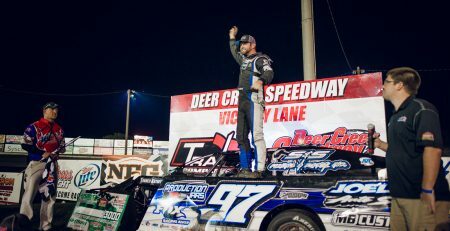 Finding speed on the track was not an issue for the racers this week with several kids pulling away from the pack in the heat races and the features to take the top slot this week. The 8T of Toby Kennedy was the first to get out in front during the pee wee feature. He led the pee wee feature for 3 laps until Coby Wagner in the 43 car made his move on turn 4 to pull ahead of Kennedy and take over the lead. Wagner easily pulled away from the pack to take the checkered flag. The K34 car of Kolton Brauer stayed tight behind Kennedy trying to slide into the second place spot, but Kennedy wouldn’t let up and held onto the 2nd place finish, with Brauer placing third this week. The 411 of Gavin Oldefendt is one of the youngest drivers in this group and not afraid to speed down the track. This week he turned out a 4th place finish. The junior Division was led by the 25 car of Joe Chisholm on pole and the 20 car of Gage Motl on the outside. This 12 lap feature race was a smooth but exciting one this week. Chisholm and Motl battled it out the entire race keeping the crowds on the edge of their seats. The 12 car of Aiden Howard was hot on the tail of the 20 car of Motl trying to slide into second place on each turn. The 34jr car of Braden Brauer held onto a steady fourth for the entire race, but challenged Howard in the 12 car several times for that third place spot. In 6th place was the 7 car of Jacob Peterson who tried numerous time to pass the 77 car of Hunter Kennedy in 5th, but with a collision in turn 2 between the two cars brought out a caution putting the 7 car to the back of the pack. With only 4 laps left and a single file restart with Chisholm still out in front, Motl in second,, and Howard in third, the 3C car of Cameron McCarrick in 7th place had contact with the 28 car of Born in 6th place pushing him up the track while at the same time the 77 car of Kennedy also slid up and off the track allowing McCarrick to drive right on past both cars and into the 5th place position. The 7 car of Peterson had to pull off on the restart and wasn’t able to finish the race. At the checkered flag, it was Chisholm, Motl, Howard, Brauer, McCarrick, Kennedy, and Born. Senior slingshots are the top class for a reason, these drivers always put on a show! This week it again was a battle between Tianna Mithun in the 53 car and Jim Chishom in the 24 car. The 60 car of Colby Mann was in third place as the top 3 cars pulled away from the rest of the pack dividing the race. The 18R car of Evan Reyna had the 4th place spot and was looking strong until the 44 car of Karlie Wagner took the inside corner on turn one to move past Reyna and into 4th place. The 4W of Tucker Williams stayed hot on 18R car of Reyna as well, and as the boys were neck and neck coming down the straightaway, Williams was able to pass Reyna on the outside on the turn putting him now in the 5th position and Reyna in 6th. Jim Chisholm in the 24 car made contact with the rear bumper of Mithun in turn 2 slowing her up and allowing him to take over the lead and the 60 car of Mann taking over 2nd place with Mithun falling back to third. Chisholm widened his lead and was able to hold onto the checkered flag this week. The 60 car of Colby Mann took 2nd. The 53 of Mithun wrapped of the 3rd place finish, and the 44 car of Wagner snatched the 4th place spot. The 4W of Williams came in 5th, with Reyna in the 18R finishing 6th this week. 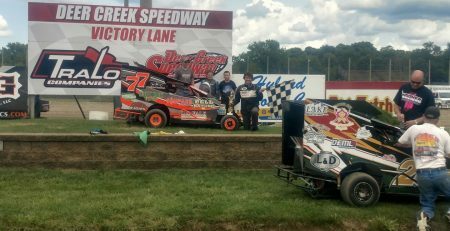 Heat race winners this week included the 43 car of Coby Wagner and the 8T of Toby Kennedy in the pee wee class. 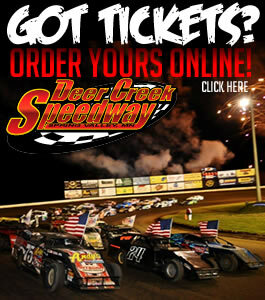 The 25 car of Joe Chisholm, the 20 car of Gage Motl, the 12 car of Aiden Howard, and the 7 car of Jacob Peterson were all junior class heat race winners. Senior heat race winner was the 53 car of Tianna Mithun.